This beautiful 45 Ocean has made her way to many tournament scales putting fish on the board. Her outside appearance is sure to please and so will the interior. However, the exciting part of this Ocean is in the engine room. Repowered with a pair of the very reliable 485hp Scania's this is for sure the best performing 45 Ocean on the market. 34kt top with a 28kt cruise and incredible efficiency of producing 1mpg at a good speed. Together with the great-running 45' hull, this boat burns half the fuel of similar boats powered by Detroit 671's. For sure it is one of if it not, the most efficient 45 twin diesel sportfish out there. The Scania's not only give her great performance these engines are commercially rated with durability and longevity not seen in a recreational diesel. Customized by Bayliss Boatworks - bowrail and pulpit removed. New(2016) CHIRP Sonar with transducer custom mounted in keel. New(2016) Tommy Bahama Interior with new wallpaper, soft goods and valances. New(2016) AC units. New(2016) power steering. New(2016) dripless shaft seals. New (2016) custom exhaust elbows. REPOWERED with one of the very best marine diesel ever made! 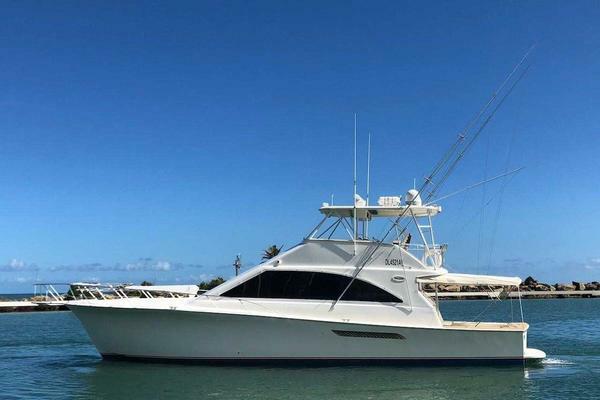 This 45' Ocean incorporates Ocean's modern hull style with the additions of all newer mechanical systems including new engines, new generator and new transmissions to name a few. Many new items such as Large Flat Screen Tv, Carpet, and interior decor are just a few that compliments the incredible interior Ocean Yachts is known for. 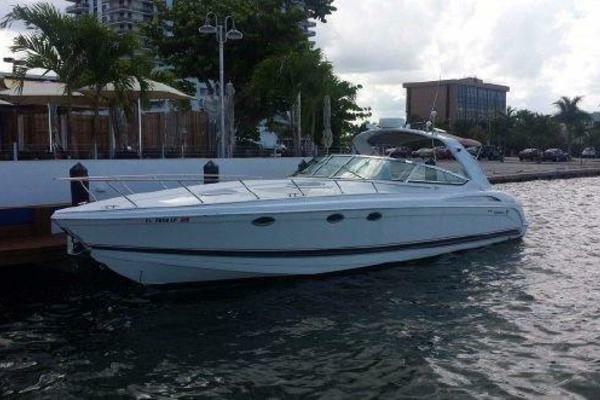 This 45' Ocean has been updated with many new items and customizations. Led TV, Aluminum housing ZF-305 A Transmissions, 10.5 kw Phasor Generator (2009), Aquamet 22 Shafts and intermediate struts (2015), Acme Propellers, Cutlass Bearings and fresh engine alignment, In-deck fish box freezer plate system ($20k), Electronics:(2016) Garmin Chartplotter, Sonar and Lowrance chartplotter, HD Radar, Sea-Tel Satellite TV, Intellian Satellite internet and phone, teak blinds, New carpet with new carpet runner in salon, Fresh painted nonskid decks, New soft goods throughout, New helm chairs, New Enclosure (2017), Groco Sea Strainers with crash valves, Reel Color teaser reels, over 260k in upgrades! When you step aboard and into the cockpit you will soon understand why this boat has won many tournaments. A large well appointed cockpit with tackle storage, cockpit freezer, washdowns and a large refrigerated fish box makes for an offshore fishing machine. A large bridge with excellent seating, great electronics and a new enclosure compliments the cockpit well when running offshore. The interior on an Ocean is very nice, however the new additions on this 45 Ocean makes it even better. A large salon with great seating and a nice large dinette to starboard. A well-equipped galley forward to port. As you step below you have a large guest head to port, a large double bunk stateroom to starboard and forward a large master stateroom with a private head. Air conditioning and heat in the salon and staterooms.